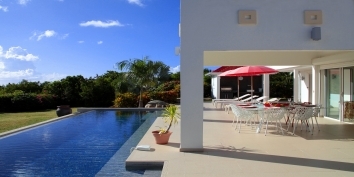 Fully staffed, luxury, Turks and Caicos Villa Rentals are extremely rare. But, in August 2013 we welcomed 3 of the most stunning, fully staffed, luxury Turks and Caicos villas to the CARIBIQUE® Villa Rentals website. We also added another 7, beautiful, non-staffed Turks and Caicos villas for rent. We now have no less than 47 Turks and Caicos villa rentals for you to choose from for your Turks and Caicos villa vacation. The new, fully staffed, luxury villas are all located on magnificent Grace Bay Beach, the most famous beach in the Turks and Caicos Islands and consistently voted one of the best beaches in the entire world! Here’s an overview of the new, fully staffed, luxury Turks and Caicos villas added to our website in August 2013. From ONLY $3,500 per night! Amazing Grace, Providenciales (Provo), Turks and Caicos Islands, is an extraordinary, luxurious, fully staffed, 18 acre, private estate, suitable for the most discerning of guests. This Turks and Caicos luxury villa rental features 9,000 square feet of luxurious living space with five beautiful bedrooms, each with private en-suite bathrooms, a stunning, 50 foot, heated swimming pool and jacuzzi. Amazing Grace is very aptly named due to its location with more than 600 feet of private beachfront, directly on amazing Grace Bay Beach, which is consistently voted as one of the best beaches in the world. Find out more about Amazing Grace, Grace Bay Beach, Providenciales (Provo), Turks and Caicos Islands. Coral House, Grace Bay Beach, Providenciales, Turks and Caicos Islands, is the ultimate luxury villa for chic, sophisticated yet simple Caribbean living. Beginning with the spectacular setting directly on magnificent Grace Bay Beach, acclaimed one of the world’s best beaches by Condé Nast Traveler Magazine, and further enhanced by a range of unique features from the Barbados coral stone construction, designer furnishings and extraordinary amenities to the tropical landscaping. Coral House offers a unique and unforgettable villa experience that will be treasured forever. This fully staffed, Turks and Caicos luxury villa rental, has 12,000 square feet of luxurious living space with five bedrooms, five bathrooms (plus two powder rooms), heated swimming pool and even a gym/yoga studio. Find out more about Coral House, Grace Bay Beach, Providenciales (Provo), Turks and Caicos Islands. From ONLY $2,250 per night! Saving Grace, Providenciales (Provo), Turks and Caicos Islands, is a newly completed, staffed, beachfront luxury villa located directly on one of the best beaches in the world - Grace Bay Beach. This Turks and Caicos luxury villa rental features more than 5,000 square feet of luxurious living space with all modern conveniences. Saving Grace has four beautiful bedrooms, each with private en-suite bathrooms, a 42 foot, heated swimming pool and stunning views of Grace Bay and every imaginable shade of turquoise and blue. Find out more about Saving Grace, Grace Bay Beach, Providenciales (Provo), Turks and Caicos Islands. 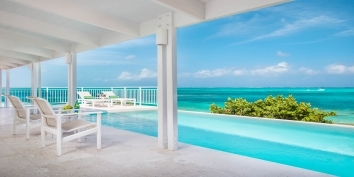 To see all of our Turks and Caicos Villa Rentals simply select Turks and Caicos Islands as the destination in the “BROWSE BY” tool bar towards the top of the page. If you have set vacation dates use the “AVAILABILITY SEARCH” box, which blends in/out to the right of the slideshow. NOTE: the rates specified are subject to change at any time without notice.